Famous for the production of heavy-duty tractors, John Deere also manufactures exceptional lawn mowing machines. One of these is the John Deere Lawn Mower Tractor D125, a riding lawn mower designed for lawns up to 2 acres. Equipped with a custom made Briggs & Stratton engine and featuring a 42-inch cutting deck, this riding mower is a versatile machine that can be used for mowing, fertilizing and seeding. Read this John Deere Lawn Mower Tractor D125 review to find out if investing in this machine could be the right thing for you. What to Consider Before Buying a Lawn Mower Tractor? Typically, if you have a lawn larger than half an acre, the best investment to make when choosing a mowing tool is buying a riding mower. On the market, there are many types of riding mowers available, but a versatile and popular machine is the lawn mower tractor. If you decide to buy a lawn mower tractor, you should consider two important factors, the grade of the tractor and its size. 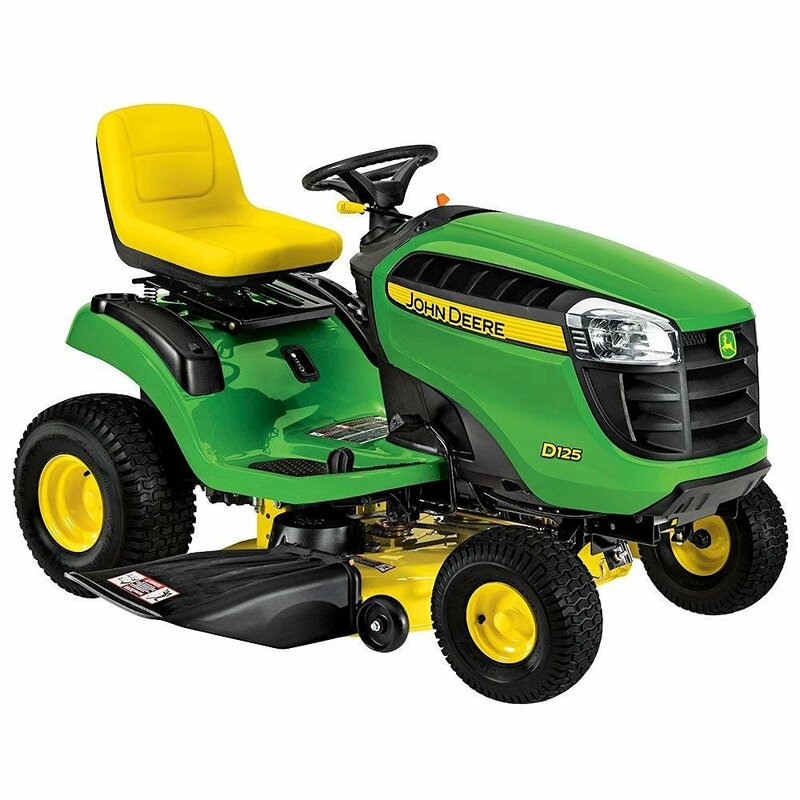 There are two grades of lawn tractors, entry-level and mid-grade. The entry-level typically have single-cylinder engines with lower powers. These machines are not exactly suited for mowing lawns larger than 1.5 acres and most of the times they have manual transmissions, which tend to be more durable but limit the speed control. Mid-grade lawn mower tractors are generally equipped with twin-cylinder engines that are suitable for lawns larger than 1.5 acres. These lawn tractors can usually be used with lightweight attachments, such as mulching or bagging kits, and have hydrostatic transmissions offering more control over the speed adjustments. Even if the mid-grade lawn tractors are more expensive compared to the entry-level ones, I recommend investing in a mid-grade lawn tractor because they are more versatile and cut the grass faster and better. 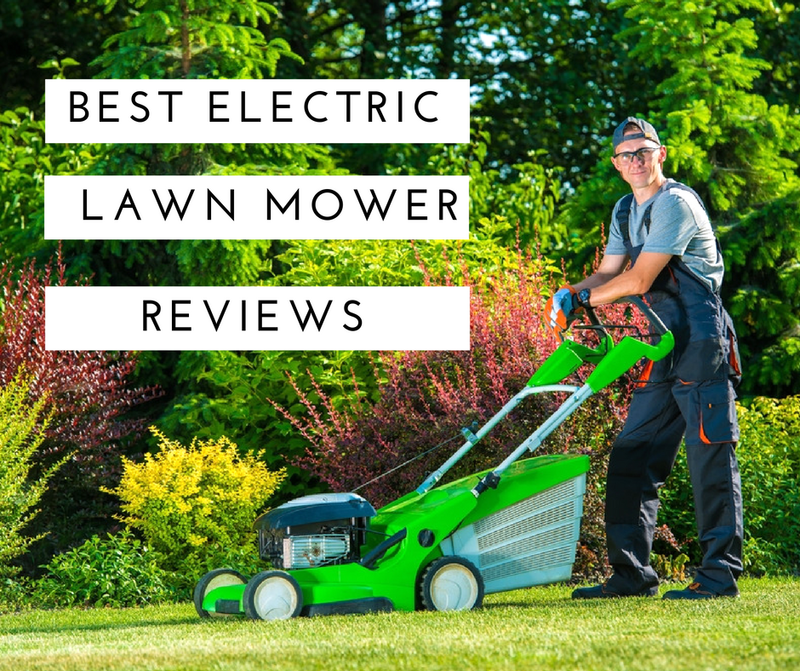 Besides choosing the right grade, you should also consider a few other things before deciding what lawn mower tractor to buy. The D125 Lawn Mower Tractor is a lawn care machine equipped with a V-Twin 20 horsepower Briggs & Stratton engine manufactured exclusively for John Deere’s machines. Boasting a hydrostatic transmission operated by a dual foot pedal, the D125 can easily reach a speed of 5.5 mph. To improve the user experience and to help you concentrate more on mowing rather than on driving, John Deere equipped this lawn tractor with a convenient cruise control system and with the ability to be driven in both forward and reverse directions. Designed for lawns up to 1.5 acres, the D125 model has an 18-inch turning radius. This might not be the best turning radius in the industry, but it is still a great choice for the price if you don’t have excessive obstacles on your lawn. This lawn tractor can be easily maneuvered both on flat and sloped terrains and features a 13-position cutting height control, which makes this machine perfect for all types of topography and grass. Powerful engine: the 20 horsepower V-twin Briggs & Stratton engine provides enough energy for a fast and perfect cut. Wide cutting deck: the 42-inch cutting deck has the right size for lawns up to 1.5 acres. Compact design: you will not need an excessive storage space. Versatile: John Deere manufactures many attachments for the D125 model, including mulchers, baggers, aerators and a yard cart. Rigid frame: the D125 boasts a sturdy steel frame. Small turning radius: the 18-inch turning radius will probably give you problems if you have many trees or other small obstacles on your lawn. Heavy: because of the large cutting deck and engine, the D125 is pretty heavy. Expensive: the John Deere D125 is one of the most expensive mowing tractors in its class. The D125 model boasts a 20-horsepower V-twin cylinder Briggs & Stratton engine that provides enough energy to the tractor to efficiently handle any type of cutting, such as mulching, bagging or simply mowing. For a faster start, the engine is equipped with an electronic ignition and it features cast-iron sleeves for a longer lifespan. For a better fuel and power management, the engine also boasts the convenient overhead valves. The engine provides sufficient power to operate the tractor on sloped or uneven terrains with ease. The 3-in-1 cutting deck of the John Deere Lawn Mower Tractor D125 boasts the Edge Cutting System that gives this machine a superior reliability and performance. The 13-gauge deck is made of steel and designed to efficiently lift the grass for an even and precise cut. The mower’s smooth underside and dual-stage E-coat powdered coating prevent the grass buildup and protect the deck from rust. The cutting deck is equipped with a convenient wash port designed for easier cleaning. You will only have to attach a water hose to the port to clean the deck from any grass residue, simple and fast. The John Deere D125 features a 13-position height adjustment range that varies from 1 to 4.5 inches. You will be able to increment the height with 0.25 inches at a time, a feature that makes the D125 a unique lawn mower tractor. If you want to keep mowing while driving the lawn tractor in reverse, the D125 allows you to do so. This lawn mower tractor is equipped with a Reverse Implement Option system that will let you continue mowing while driving in reverse. To activate this option, you have to stop the tractor, push the RIO button and operate the shift lever into the reverse mode, then release the button to keep mowing while driving backward. For an easy installation of the attachments, the D125 features the CargO Mount system that is basically a combination of front and rear mounting points placed in convenient positions to allow an easy attachment of all the accessories. Most of the users are satisfied with the ease of use and overall performances of the John Deere D125. The most appreciated features are the cutting height adjustability and the smooth running. It is also appreciated the low level of noise of this machine compared to other similar mower tractors. However, some users complained about the cutting quality, which is not always uniform. The RIO system is also annoying to use. 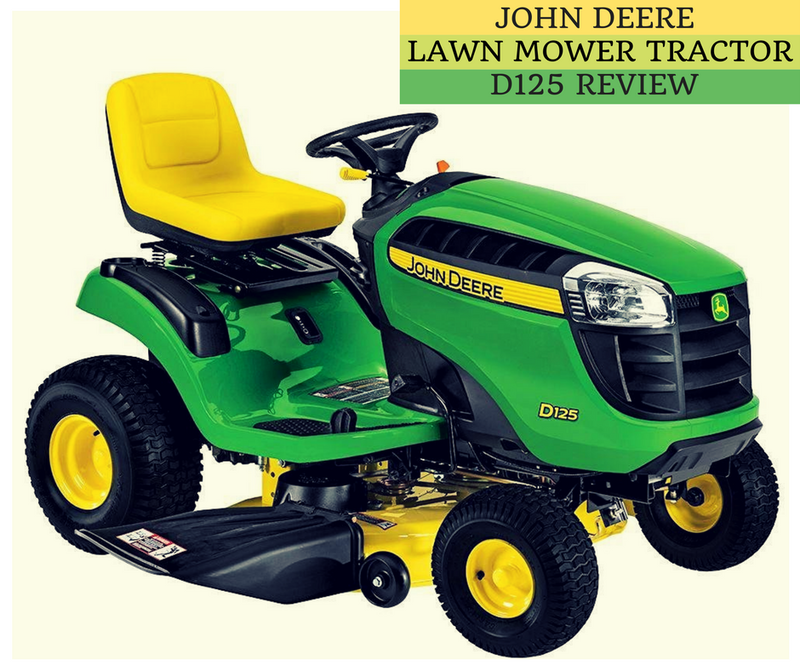 You can read more John Deere Lawn Mower Tractor D125 reviews here. If you have a smaller lawn and need a more compact mowing tractor, then this Troy-Bilt Premium Neighborhood Riding Lawn Mower could be an excellent alternative. 30-inch cutting deck: the Troy-Bilt tractor has a smaller cutting deck that is only 30-inch wide. 18-inch turning radius: similar to the John Deere D125, this mower tractor also has an 18-inch turning radius. Less powerful: the Troy-Bilt features a 420cc engine and reaches a maximum speed of only 4.25 mph. You can find out more about the features of this lawn mower tractor here. With similar performances compared to the John Deere D125, this lawn mower tractor is a great replacement if you are looking for a less expensive alternative. 42-inch cutting deck: the YTA18542 boasts a cutting deck of the same dimension as the one of the D125. Air Induction technology: a feature similar to the D125’s Edge Cutting System. 18.5-horsepower: the engine’s capacity is slightly lower compared to the D125 engine. Wide enough but less powerful, the Yard Machines Riding Lawn Mower was designed to be used on small hills and ridges. 420cc engine: you will get less power with this lawn mower tractor, but the maneuverability on sloped terrains is great. Excellent price: you will definitely appreciate this lawn mower tractor if you have a tight budget. 42-inch cutting deck: this Yard Machines mower tractor has a cutting deck of the same size as the D125. The John Deere Lawn Mower Tractor is not perfect, but its high-quality makes it an excellent lawn mower tractor ideal for multiple uses. You will be able not only to mow your lawn choosing the favorite cutting option between mulch, discharge or bagging, but you will be able to use different attachments to perform other light chores in your garden. The machine is easy to use and, unlike any other manufacturer, John Deere’s operators are even available to teach you how to drive this beauty. The part I like best is the RIO system that allows you to keep mowing while driving in reverse. Although it is rather annoying to stop the tractor each time you want to engage this function, I believe that it is just a matter of getting used to it. In addition, the cleaning ease and compact dimensions make all the possible flaws insignificant. If you are searching for the perfect lawn mower tractor, I suggest you give the D125 a look.